Edmonton is experiencing a ramen craze, but there's something else that is popping up all over the city - bubble tea spots! I find that Taiwanese bubble tea and noodle soups tend to go hand in hand, so I'm not surprised that more bubble tea and snack shops are opening around the city. Located just north of Grant MacEwan on busy 109 Street is Purple Bubble, and you'll see their signature purple hue coming from the windows as you drive by. I stopped by after dinner one evening to check out the space and see what they had to offer. While bubble tea isn't a go-to for me like it was in my younger days, I definitely appreciate a good milk tea every once in a while! 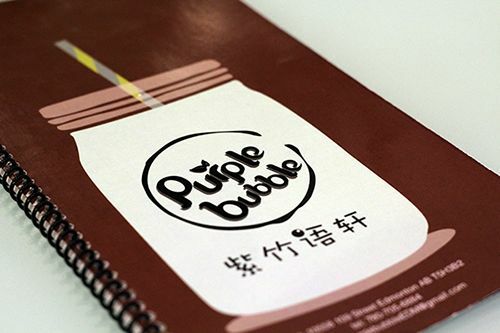 At Purple Bubble there are a variety of drinks and a handful of snacks and desserts you can order as well. When it comes to bubble tea I'm a green tea or traditional milk tea kind of girl. The Original Milk Tea ($5.49) at Purple Bubble is smooth and isn't overly sweet. making it a winner in my books. 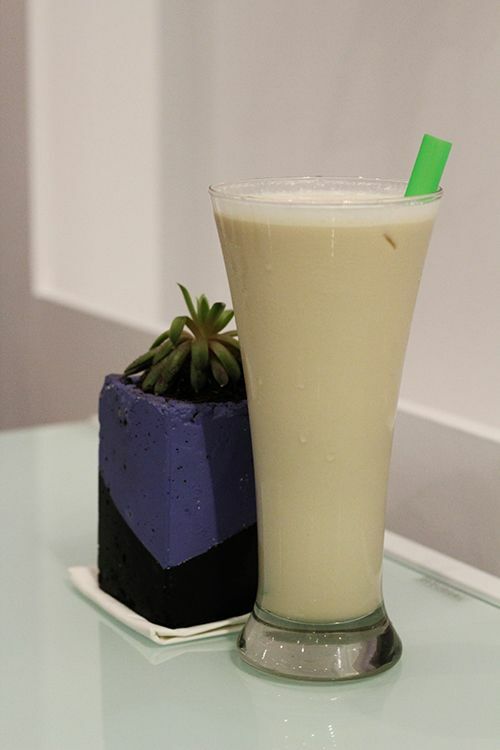 The menu has an extensive list of milk teas, including some specialties like Hokkaido Caramel milk tea and Pudding milk tea. If tea isn't quite your thing, Purple Bubble also offers fresh fruit smoothies and fruit slush. One thing that separates Purple Bubble from all the other bubble tea spots in the city is their Blooming Art Tea ($6.99). 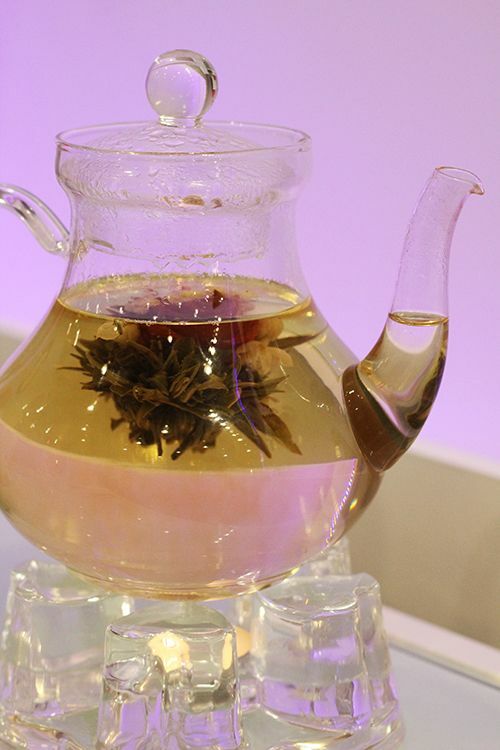 A clear teapot suspended over a tealight holds a single flower bulb that "blooms" as it steeps. It really is quite lovely to see the flower open, and it makes me think I need to get myself a clear teapot! When it comes to the snacks, Purple Bubble has both sweet and savoury offerings. There's the usual fries and Chinese snacks like dimsum and dumplings, but on the more interesting side there's Taiwanese fried chicken, seafood ramen, Taiwanese style rice bowls and even Korean style spicy rice cakes. As this visit was after dinner we decided on an order of Egg Waffles ($4.99) - one of my favourite street foods in Hong Kong. 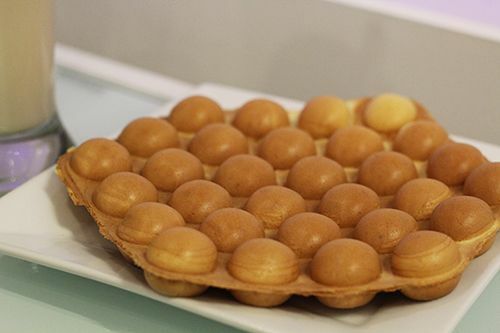 Very few places in the city offer egg waffles, and those that I've tried have been quite disappointing. Luckily the puffy egg waffles at Purple Bubble are the best I've had in the city. Served fresh out of the waffle maker, the waffles are light, puffy, eggy, and lightly sweetened. For a dessert option Purple Bubble has Snow Ice ($6.99), which is their variation on a bowl of shaved ice. 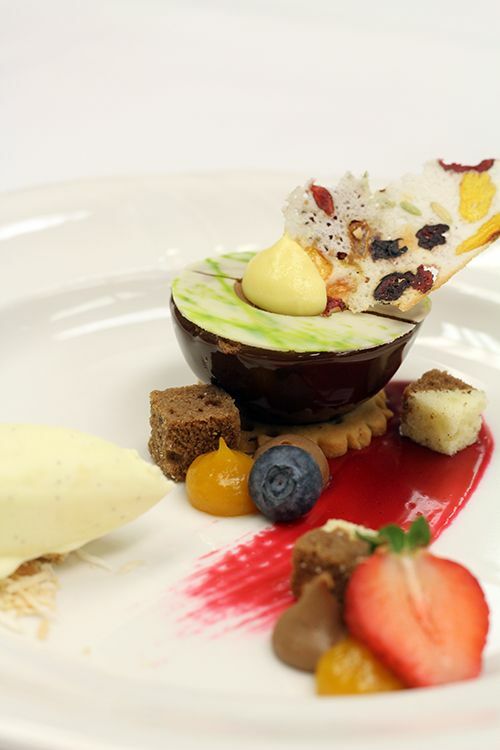 This dessert is available in four different flavours: Matcha, Vanilla, Strawberry, and Mango. We opted to go with the mango, and the shaved snow came topped with fresh mango chunks and a light drizzle of condensed milk. 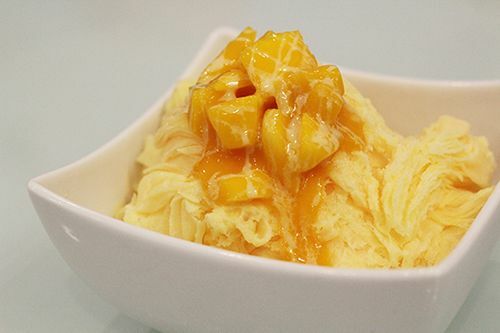 The snow was fluffy and creamy, and the mango topping sweet and fragrant. However this shaved snow did have a bit of an artificial flavouring to it, so it didn't quite hit the spot for me. Purple Bubble is in a great location along busy 109 Street and just a quick walk away from the Grant Macewan campus. It would be a great spot for students to study or catch up with friends, and it's in a place where it is convenient to stop on the commute out of downtown. I would happily stop by for some tea and egg waffles if I were in the area and craving something sweet! Check them out and let me know what you think! For the past two years my family has entrusted me with the task of preparing Christmas dinner. 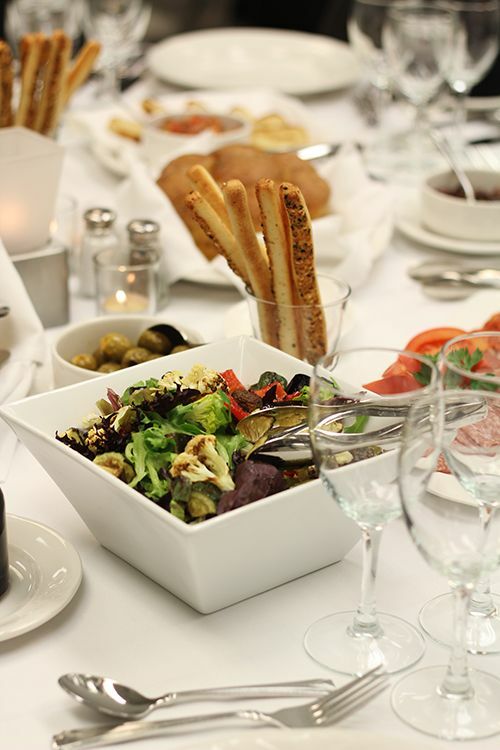 It's exciting to plan a menu and surprise your guests with beautiful dishes, but I've also found out it can be incredibly stressful! You need to remember to defrost your turkey, buy and prep all your ingredients, and somehow manage to serve your guests at a reasonable time all on your own. Man, it's not easy. 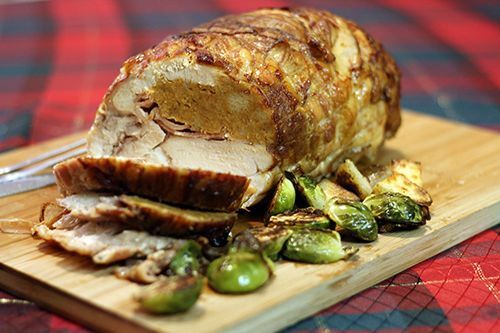 This past Christmas I was contacted by Echelon Foods about serving a turducken roast for Christmas dinner. 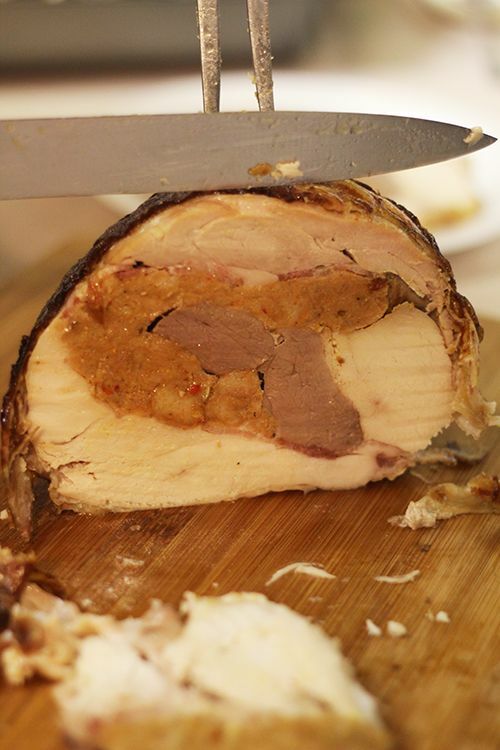 I've always wanted to try a turducken, and seeing that it meant that I could have one less dish to worry about for my family gathering I happily agreed to try it out. So what exactly is a turducken? It's a completely de-boned turkey with duck and chicken wrapped up inside of it! Echelon completes their version with a chicken apple or Italian sausage stuffing inside too. I chose to serve up the Bacon Wrapped Turducken Premium Roast this year, and it was so easy to prepare. The football-sized roast was a solid mass of a deboned turkey, skinless chicken breast, skinless duck breast, and Italian sausage stuffing, all wrapped up with strips of bacon. After 3 days of defrosting in the fridge all I had to do was unwrap the roast and place it on a roasting pan. Four hours later it was ready to serve along with all the sides I had prepared for the meal. The turducken was cooked according to Echelon's instructions and turned out great. The roast was easy to serve and I didn't have to think about how to carve a huge turkey! The crispy bacon gave the turkey a nice smoky flavour and the meats were fully cooked. The turkey was a tad on the dry side, so I would cook it for a little less time if I were to do a turducken again. The only issue I had with the roast was that the stuffing was quite salty - at either end the roast it seemed like there was a higher ratio of stuffing to meat, so the roast was quite salty eaten alone. 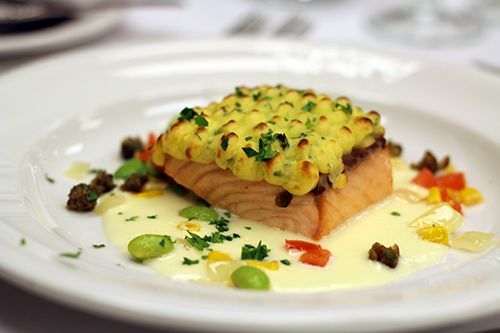 When paired with a starch on the side it wasn't a problem. 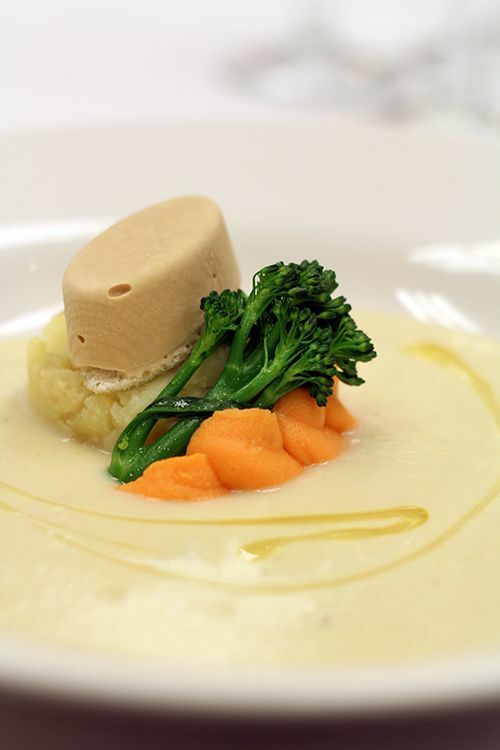 If a turducken is something you've never had before, it's definitely one of those things you should have on your foodie bucket list. 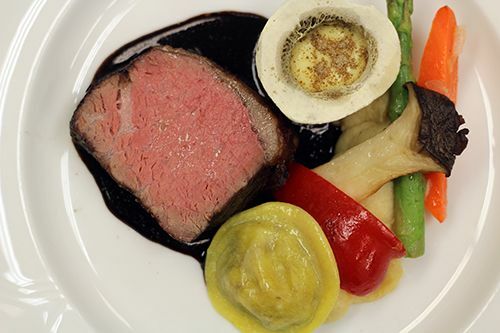 There's plenty of tutorials and recipes out there you can follow to make your own, but having one pre-made that you can just throw into the oven to roast is less time consuming and way more convenient. 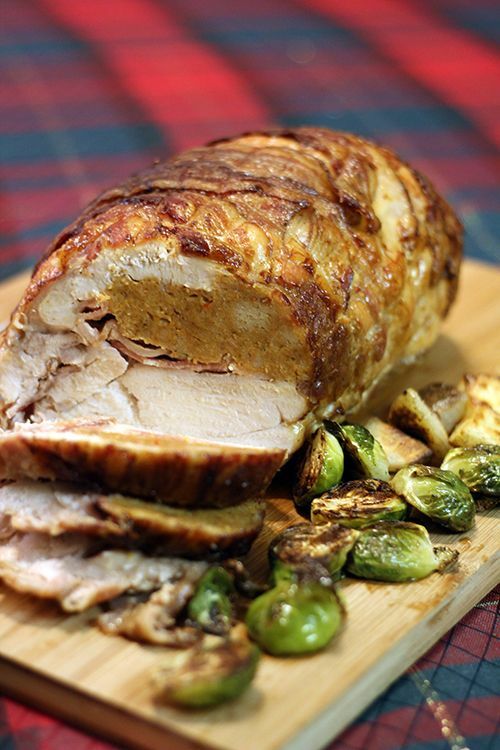 So whether it's Christmas, Easter, Thanksgiving, or just a fun dinner party with loved ones, give the Echelon Turducken a try and let me know what you think! 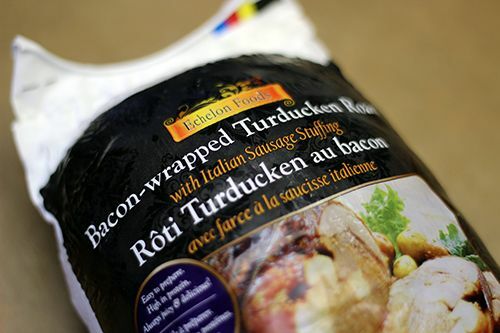 *Disclosure: Echelon Foods sent me a turducken roast for consideration of a review. Views expressed in this post are solely mine. This post is 100% my opinion, and as always, my priority is to you, the reader, to present an unbiased, thorough review. 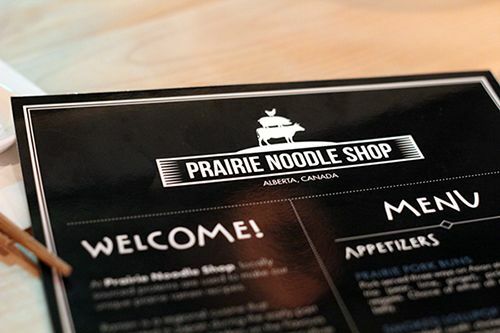 With four successful sold out pop up events and a fully funded Alberta BoostR campaign, Edmontonians have been patiently awaiting the opening of Prairie Nooodle Shop. 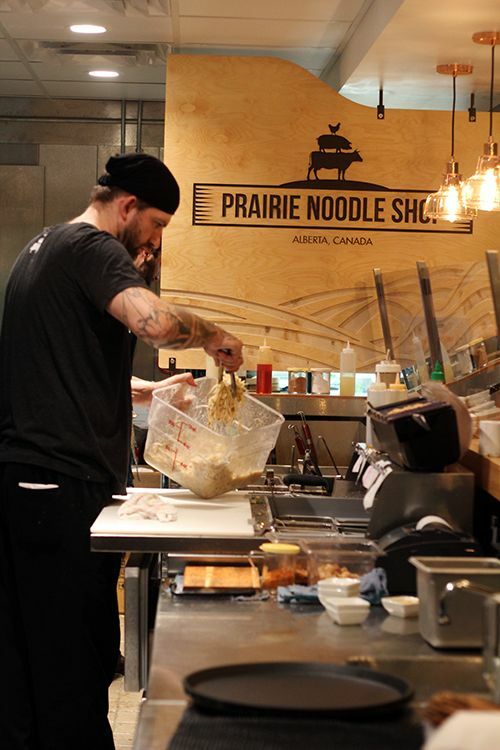 As of opening day on December 15, 2015, Prairie Noodle Shop has been selling out nightly. 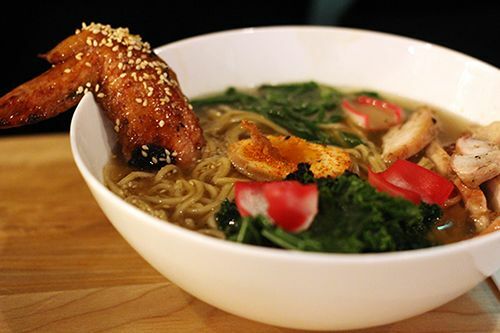 Edmonton's ramen culture has certainly grown over the last year. With the opening of Kazoku Ramen and other Japanese restaurants offering the bowls of noodle soup on their menus, Edmonton is certainly ready for a ramen boom. 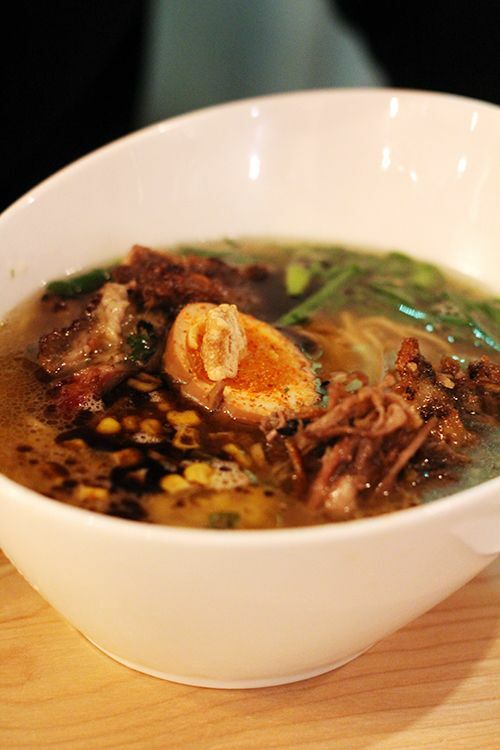 Ever since I had my first bite of Prairie Noodle Shop's Prairie Pork Ramen at their first pop up in November of 2014, I was hooked. 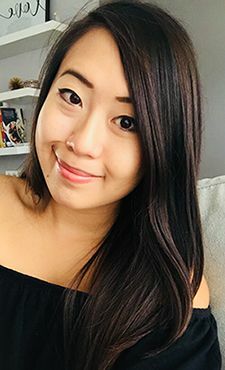 I'm forever grateful that the group of friends behind this ramen shop decided that Edmonton needed a dedicated ramen shop unique to our city! I had the chance to stop by for a bowl of ramen before heading in to work one evening, and I knew I had to show up early to secure myself a bowl. Despite being open until 9PM, the restaurant has been selling out early around 7PM each day. My boyfriend and I arrived at 5PM to a lineup of about 10 people, but the quick turnover meant a wait time of about 15-20 minutes. 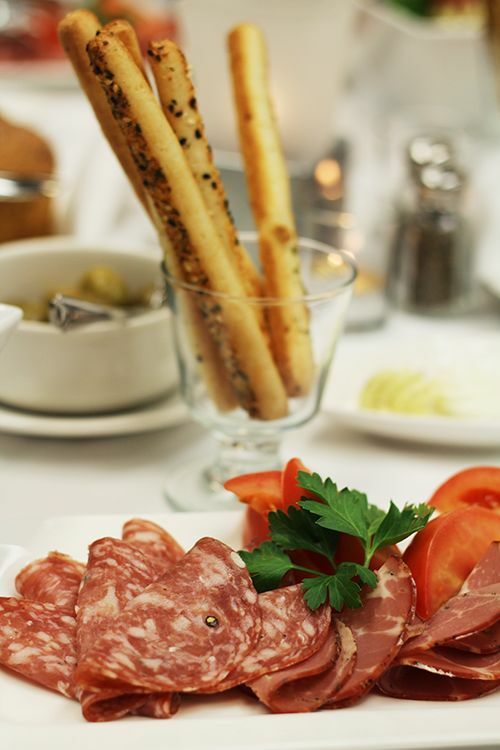 Grabbing a seat for two at the communal table allowed us to take in all the action going on in the restaurant. I love the use of the chalkboard highlighting where ingredients for the ramen bowls have been sourced, and the placement of farm animals in woodwork to liven up the space and emphasize the prairie provinces as inspiration for the noodle soups. I've always been asked which of the four bowls was my favourite from the pop up dinners, and it has always been hard to say as I haven't been able to make a side-by-side comparison of the bowls! Fear no more - the time is here. I've always thought I loved the Prairie Pork Ramen ($15) the most, so that was my choice for the evening. Accompanied by roasted pork belly, smoked pork shoulder, a crispy chicharron, and the famous umeboshi egg, the handmade noodles maintained their texture and elastic bite from start to finish of the bowl. The corn, green onions, and blackened garlic sesame oil added some flavour, but I found that the broth was missing the depth of flavour and umami I so clearly remembered from the first pop up I had attended. It was a great bowl, but it was missing something! The umeboshi egg made up for it though - that pickled plum flavour is addicting and I packed one up to go! Our second bowl was the Roasted Barley Chicken Ramen ($15) featuring a yakitori-style chicken wing, marinated chicken thigh, and a roasted barley tare. The chicken broth is clear and light, and the bowl is rounded off with sauteed kale, pickled pearl onions and the umeboshi egg. The chicken and roasted barley flavours came through in this bowl, but like the prairie pork, we found the broth itself to be underseasoned and a little underwhelming. With a couple tweaks, I'm sure this bowl could be as great as the one I have in my memory from the previous pop ups. It's been incredible following the team behind Prairie Noodle Shop go from pop-up dinners to a brick-and-mortar restaurant. As with many new restaurants there are bumps and hurdles to overcome in the first few weeks of opening, and Prairie Noodle Shop definitely has some tweaking to do in order to fulfill the demand for their bowls. The small ramen shop was built to make up to 200 bowls per day, but with the constant line ups and increasing demand, the kitchen has been working hard to pump out 250-300 bowls. This has me wondering if demand could be compromising quality, which could explain the little discrepancies between these bowls and those I have in my memory. Regardless, Prairie Noodle Shop has been highly receptive to feedback, and now close for a portion of the afternoon for a break to focus and improve the quality of their product. As an avid supporter since day one, I'm very excited that Prairie Noodle Shop is here to stay and no longer has to turn away ramen enthusiasts! With some improvements and a change in logistics, I'm sure the ramen bowls will be able to match those in my memory. Thank you to Terry, Arden, Ryan, Jeff, and Craig for taking the risk and bringing your dream to life, and no longer making me wait months to get my hands on umeboshi eggs. 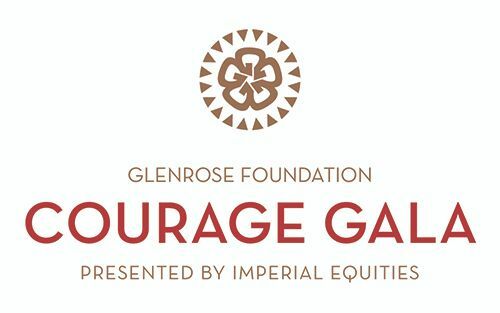 Congratulations on opening!